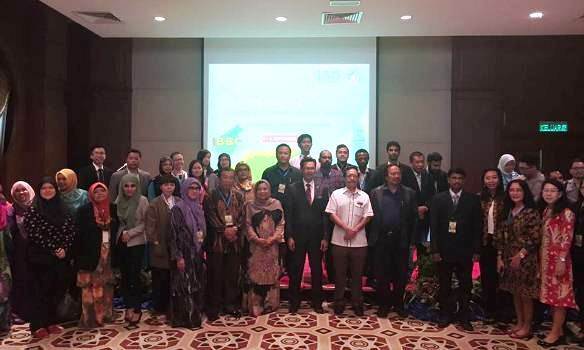 THURSDAY, 08 SEPTEMBER – A total of 100 participants comprising locals and foreigners participated in the 7th International Borneo Business Conference (IBBC) that started yesterday. Held at Dewan Bankuasi (Banquet Hall), Universiti Malaysia Sabah (UMS), the conference was organised by the Faculty of Business, Economics and Accountancy (FPEP), UMS. The ceremony was officiated by Dean of FPEP, Associate Professor Dr. Raman Noordin. In his speech, he welcomed all participants and hoped that the conference would offer useful input and output through the sharing of knowledge and presentations. He also expressed his gratitude to the three panellists who deliberated on the subject, “Business Opportunities in a Challenging Environment”. They were the Chief Executive of Sabah Economic Development and Investment Authority (SEDIA); Chief Executive Officer of Institute of Development Studies (IDS) Sabah, Datuk Mohd Hasnol Mohd Datuk Ayub, and a Professor with FPEP, Professor Dr. Syed Azizi Wafa Syed Khaled Wafa.